Organised by: Office of the Campus Director in Collaboration with All KCDIO, Kuantan Campus, IIUM. Humility Day No. 3/ 2019: Jungle Trekking. Office of Campus Direction in collaboration with all KCDIO organised the third Humility Day of 2019. This time, the activity chosen is jungle trekking at IIUM Kuantan Recreational Park or commonly known by IIUM community as IIUM Kuantan Hill. 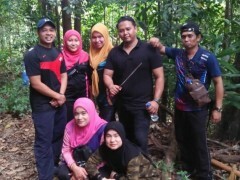 The objective of having this jungle trekking activity was to clear and maintain the existing trail at the recreational park for easy trekking and access in future. The participants were encouraged to bring their own tools such as machetes and gloves for the purpose of clearing the trail. It took about 45 minutes for participants to reach top of the hill. Series 3, Humility Day IIUM Kuantan Campus mainly focused on Sustainable Development Goals 15 which is to sustainably manage forest without causing destruction to it. Other than that, this series also promotes good health by involving in active lifestyle among IIUM community overall.